A special exhibition explores 800 years of debate about the creation of Stonehenge will open in December at the New Stonehenge Visitor Centre. No monument has been the subject of more speculation and controversy than Stonehenge and a great number of theories about it’s origin range from the magic of Merlin to a piece of Roman engineering. A temporary exhibition specially created by English Heritage to complement the permanent display of the soon-to-be-opened Stonehenge visitor centre will show that the monument’s origins have been debated for centuries, until modern archaeology came along to establish what is now accepted to be fact: Stonehenge was built by late Neolithic people from Britain in about 3000 BC. “Set in Stone? How our ancestors saw Stonehenge” charts over 800 years of ideas and debate, from 12th-century legends to radiocarbon dating reports in the 1950s – on who built Stonehenge and when. Through an interesting assemblage of original manuscripts, contemporary documents and historic objects on loan from many institutions, it explains what gave rise to these (now disproved) ideas, what made them credible at the time, and how modern archaeology and science finally opened the lid in the 20th century. Thanks to huge leaps and bounds in the progress of science and research, much is now known about Stonehenge, e.g; the date and most likely sequence of its construction, the lifestyles of the people who built and lived near the monument and how the landscape around Stonehenge changed through prehistory – all of which will be presented in a thrilling permanent display at the new visitor centre which opens on 18 December. The first detailed account of Stonehenge was in Geoffrey of Monmouth’s History of the Kings of Britain, written in Latin around 1136. A precious manuscript on loan from the British Library relates how the wizard Merlin brought a stone circle from Ireland using magic in 480AD to celebrate the victory in battle of a British king over a Saxon king. Throughout the medieval period this idea was popular and reproduced many times. There are sketches of Stonehenge by Inigo Jones, the 17th-century architect, who believed that the monument was built in the “rare perfection” of a “flourishing age” that in his view could only be Roman. 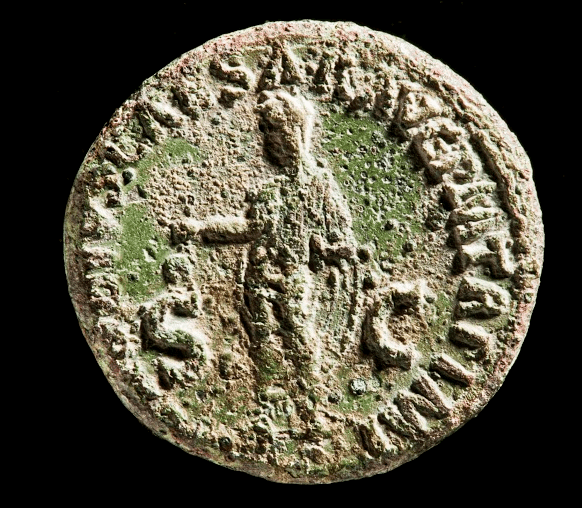 Roman coins, pottery sherds and jewellery discovered near the monument, on loan from the Salisbury and South Wiltshire Museum, further explain why people in the past believed in the Roman link. Early Bronze Age artefacts found from barrows near Stonehenge, on loan from Wiltshire Museum, offer glimpses to the once prevalent idea that Stonehenge was connected to the civilisations of south Europe. These objects and Stonehenge itself have striking similarities to objects and monuments from the Mediterranean and explain why the idea held sway for a while. 17th-century scholar John Aubrey advanced the view that Stonehenge was so old it pre-dated written records and that it was a British monument built by British Druids, not one of invaders or incomers. William Stukeley took his idea further to affirm Stonehenge was built by Druids practicing an early form of pure Christianity. On display is early surveying equipment that Stukeley and Aubrey would have used, such as an 18th century theodolite. A significant turning point came when William Gowland, after excavating at Stonehenge in 1901, concluded that it was built in about 1800BC, at the point when the Stone Age, or Neolithic period, was turning into the Bronze Age. On display are his thesis and numerous historic photographs from the English Heritage Archive that show excavations in the early 20th century. 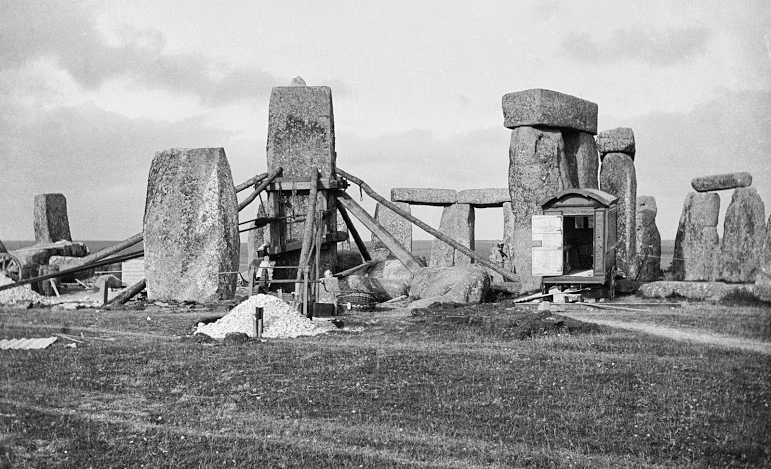 The idea of a Mediterranean origin for Stonehenge was dealt a final blow by the advent and application of radiocarbon dating, revealed to the world in a copy of the 2 June 1952 edition of TIME Magazine. This dating finally established that Stonehenge was a British monument of the late Neolithic. Set in Stone? How our ancestors saw Stonehenge, exhibition from 18 December 2013 to 14 September 2014, new Stonehenge visitor centre. Admission is included in the entry price for Stonehenge.